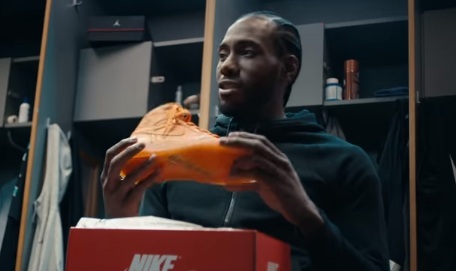 Foot Locker has launched a new commercial starring Kawhi Leonard to promote the new Jordan x Gatorade Air Jordan 1’s. The 60-second spot features San Antonio Spurs forward in the locker room opening a Nike shoe box and finding the new Gatorade Jordan 1’s. Apparently, they are a gift from his teammate LaMarcus Aldridge. Leonard puts them on and shares the “event” with his fans on social media, letting them know he’s got “the new kicks on” and that he’s ready to start the day. As the commercial continues, Leonard is seen in the recording studio, together with rapper Nipsey Hussle, who’s singing “Rap N***as”, then at an auction, buying something he doesn’t need for one million dollars, breaking a karate board during a karate class, performing stunts with his car, and DJ-ing in front of an audience of thousands of electronic music lovers while on stage French dancers Les Twins (twin brothers Laurent and Larry Nicolas Bourgeois, who are also choreographers and models) are showing off their skills. All his adventures throughout the day are posted on social media with the hashtag #BoldLikeKawhi. At the end of the spot Leonard is seen in the locker room again, approached by a bunch of journalists asking him if he has any comment about his previous day. “I was hacked.” – he answers and a final disclaimer informs that Leonard “does not now, nor has he ever, used social media of any kind”, “Any portrayal of Kawhi using social media is entirely fictional, including any use of hashtags, emojis, etc.”, and that “Any images bearing resemblance to Kawhi Leonard are purely coincidental”.